this past weekend, my gal pal carly & i ventured out in the cold for brunch. we decided on little market american brasserie, located in the gold coast at the talbott hotel. little market offers "a diverse, yet approachable menu with hearty american dishes, european inspirations & a distinctive design." the restaurant is adorable. the decor is cozy, but beautiful ... and the overall environment is just très chic. i loved it. kale, green apple, celery, basil & lemon. ok, i was obviously drawn to this vibrant beverage because of the kale. duh. the green machine was, to be frank, freaking amazing. soooo fresh. and not at all heavy like you might expect a kale drink to be. even carly loved it - and she doesn't do that kind of thing. 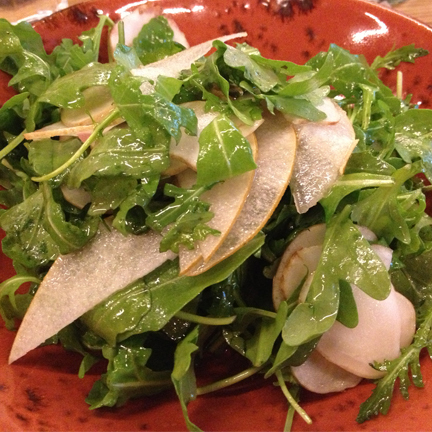 pear, arugula & red wine vinaigrette. um, yum. super light. maybe a smidge too light even. but oh so tasty. this was my first experience with sunchoke. it kind of tasted like a crisper, less flavorful apple. nothing like i expected. but delicious nonetheless. i loved little market. a perfect green brunch. i will certainly be back again -- probably in the summer when they've got the outdoor seating set up. bloomington, indiana : the irish lion.